Evidently Berlin, a world city of cultures and the capital of Germany, is slowly changing into a spiritual place. Many religious traditions are represented here, as well as all Buddhist traditions from Asia. Berlin is a city where many memorials and monuments call to mind the victims of World War I and II and the genocide of the Jewish population in Europe. A traditional Tibetan-Buddhist Stupa will strongly influence the development of Peace and Harmony between people, as well as in the environment. The charity association Bodhicharya Deutschland e.V. 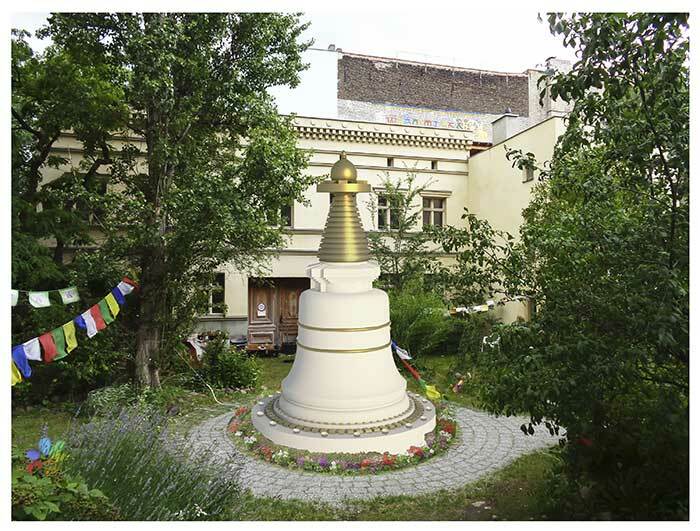 is planning to build a 6 metre tall stupa on its Berlin site. The 17th Karmapa Orgyen Trinley Dorje recommended to construct a Kadam-Stupa and laid the foundation stone for this sacral structure during his first visit in 2014. The future Stupa is intended to become an attraction for the many visitors of the Centre for Peace and mutual Understanding. The project is guided by Khenpo Karma Namgyal of the Karma Lekshe Institute in Kathmandu/ Nepal and based on historical plans of the Stupa on top of the Mahabodhi Temple in Bodhgaya, India. This is the place where Siddharta Gautama realized complete Buddhahood and which has become the most important place of pilgrimage for Buddhists from all over the world. You can find out more about the project, its progress, and the opportunities to help and support the project here: www.stupa-berlin.de/english/.